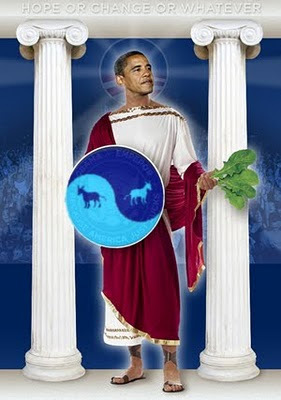 "Obama, an unfettered executive wielding a swollen state, began and ended his address by celebrating the armed forces. They are not “consumed with personal ambition,” they “work together” and “focus on the mission at hand” and do not “obsess over their differences.” Americans should emulate troops “marching into battle,” who “rise or fall as one unit. Like other progressive presidents fond of military metaphors, he rejects the patience of politics required by the Constitution he has sworn to uphold." There is a false note in this otherwise harmonious column. Will asserts by omission that the desire for an unfettered executive branch is a uniquely progressive Democratic Party desire. Not so. The executive privilege, unitary executive definition, and and war power assertions of the Bush/Cheney Imperial Presidency is still fresh in the Dividist's mind, even if forgotten or minimized by Mr. Will. The single greatest disappointment of the Obama Presidency has been his willingness to use the Bush/Cheney Unitary Executive definition as a starting point to further expand the power of the presidency. The appetite for expanded executive authority is also evident in all of the current batch of Republican Presidential hopefuls except Ron Paul. None more so than Big Government Conservative Newt Gingrich, who would also like to remove any judicial constraints on both the executive and legislative branch. The Dividist is not sure which is more frightening - New Gingrich claiming authority to disregard or dismantle the judicial branch: "I decided that if you had judges that were so radically anti-American that they thought ‘one nation under God’ was wrong, they shouldn’t be on the court." - or - President Obama directly dismissing the joint session of congress in his SOTU address: "You won't act, so I am." Both are depressing prospects to consider. Today, the republican House of Representatives, divided government and the Supreme Court are the only meaningful constraints on the democratic executive branch. This election cycle the GOP is likely to maintain their majority in the House and take majority control of the Senate. Senate control will add one more fetter to a democratic president but, if recent history is a guide, will put no additional limitation on the power of a republican president. This should give pause to George Will and anyone else who purports to care about Madisonian Democracy and the checks and balances enshrined in the Constitution. The Dividist wonders what George Will will feel about the prospects for an "unfettered executive" if it is a Republican is in the White House who is not even constrained by a Democratic majority in either the House or Senate? 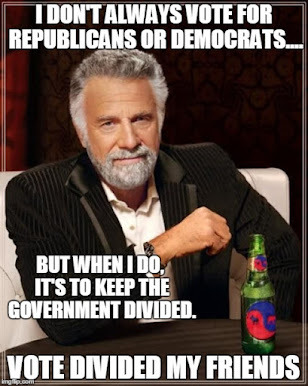 There is a real risk that we will return to One Party Rule under the Republicans in 2013. If it becomes obvious that the GOP will have the majority in both the Senate and the House, the Dividist hopes that anyone as concerned about executive branch overreach as George Will would endorse the re-election of Barack Obama to prevent severing any of the remaining tenuous fetters still constraining the executive branch beast. 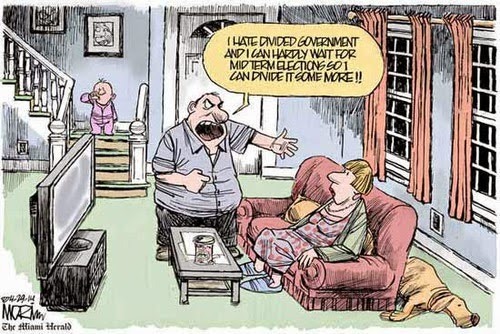 The Dividist is hopeful, but will not be holding his breath.